Men’s Track and Field Races to Second in Home Invite | The Gettysburgian. Bullets track and field athletes line the field to honor graduating seniors (Photo courtesy of Colleen Campbell). The Gettysburg College men’s track and field team took second place of 15 teams at the Mason-Dixon Invitational hosted by Gettysburg College Saturday. The invitational was the lone home meet for the Bullets, and the team made sure to show off for prospective students on Get Acquainted Day. Pennsylvania State University at Harrisburg won the meet with 118 total points. The Bullets followed close with 114 points and beat Centennial Conference rival Dickinson College by three points. Frostburg State and McDaniel College rounded out the top five spots with 108 and 76 points, respectively. Prominent individual performances by members of the Gettysburg team included a first-place finish by senior Ty Abdul-Karim in the 100-meter dash. Abdul-Karim posted a personal record of 11.10 seconds in the competition. This victory was Abdul-Karim’s second win of the season, and his new personal record for the 100-meter dash ranks him fourth in school history for that category. Abdul-Karim also placed third out of 45 competitors in the 200-meter dash with a time of 23.02 seconds. This is Abdul-Karim’s second season with the team. First-year Nicholas Grissinger finished first of 15 competitors in the 400-meter hurdle competition with a time of 57.44 seconds. This time is a new personal record for Grissinger and his second event win of the season. Grissinger beat out his nearest competitor by nearly two seconds. Junior Mike Miller earned runner up recognition in the 10,000-meter run with a time of 34:47.58 minutes, which qualified him for the Centennial Conference Championships next week. Three additional Bullets captured third place during the Invitational. With a distance of of 21-3 1/2 in the Men’s long jump, sophomore Kenneth Barnes took third of 28 in the competition. Sophomore Nate Trinidad Doherty finished third of 27 in the Men’s Javelin with a score of 152-3, and, with a jump of 40-5 ½, junior Joe Amadio was third of 10 competitors in the Men’s triple jump. Junior Matt Robinson placed fourth out of 15 competitors in the one-mile run with time of 4:31.18, respectively. The historical Mason-Dixon mile was dominated by members of the Gettysburg track team. Positions four through nine were filled by the Bullets. In fifth place was junior Alex Petrecca, while sixth place was earned by first-year Dylan McKeever, seventh by sophomore Aren Heitmann, eighth by first-year Christian Rodriguez, and ninth by first-year Jack Kenyon. After the one-mile competition, Petrecca returned to the track to take fifth in the 800- meter run with a time of 2.52 minutes, respectively. Junior Thaddeus Cwiklinski raced to sixth in the 400-meter dash with a time of 51.95 seconds. Towards the end of the meet, a brief break was taken on the track to honor the graduating seniors. Six Bullets will leave the Gettysburg Men’s track team in May. Covering all events, these Bullets are co-captain Thomas Clark from the multi, co-captain Robert Weisensee in mid-distance, Abdul-Kharim in sprints, Ryan Thompson in sprints and jumps, and Harry Thoman and Caleb Parker from the distance squad. The performance at the home invitation serves as proof to Clark’s statement. 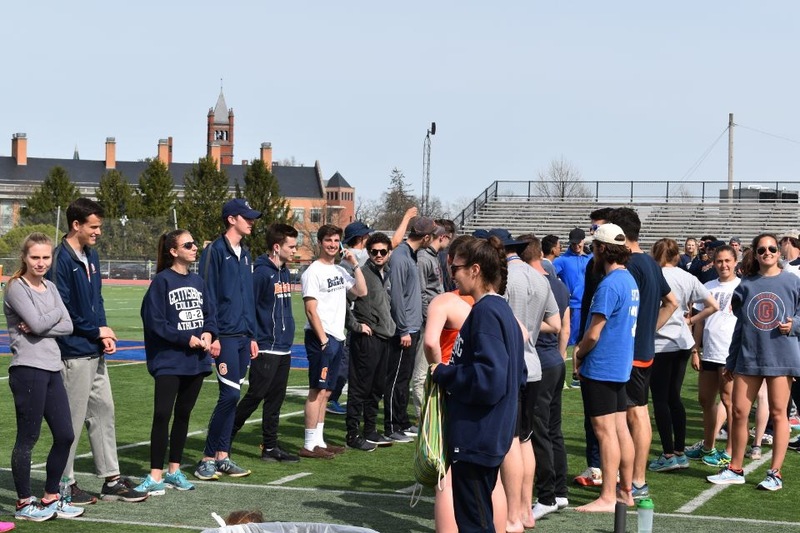 The Gettysburg College Men’s Track and Field team will end its regular season in a final tune up before Centennial Conference Championships at Shippensburg University this Saturday at 9a.m. John Zak '21 is a staff writer for The Gettysburgian who writes primarily for the sports section. He has covered a wide variety of sports including men's and women's soccer, men's and women's cross country, men's and women's basketball, baseball, and football. He is from Daytona Beach, Florida and is an avid fan of both the New York Yankees and New York Giants, while supporting the Notre Dame Fighting Irish in college football and basketball. He is double majoring in History and Political Science with hopes of attending law school after graduation. Follow him on Instagram @john_zak_iv_ .